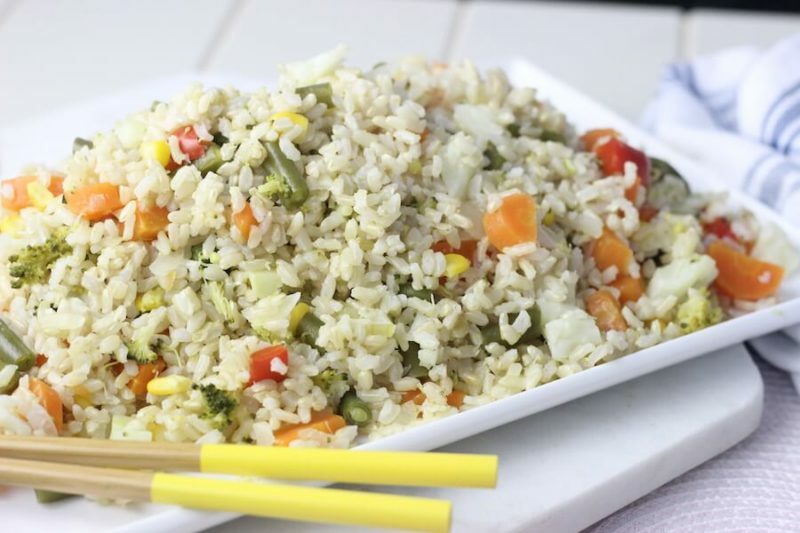 Home//Thermie ‘kinda fried’ Rice – perfect every time! This Thermomix ‘fried’ rice is another one of our dishes that’s an all-in-one meal. You just need about 15 minutes to chop everything up, wack it on, go bath the kids, clean up, fold some washing (or if you’re super lucky and retired like our Mum you’ll go have a cuppa on the verandah – oh the dream). Either way, basically while it cooks you can do what you please. You’ll need almost every compartment of your Thermomix for this dish. Bowl, internal steaming basket, and your top two steaming baskets. Fill up your thermie jug with 1L of water. Insert simmering basket and add rice. Secure lid and sit large steamer basket on top (MC OFF). Add onion, bacon if using and hard veggies in the bottom tray. Like carrot, beans, frozen veg (peas/corn), capsicum. Add your soft veggies like broccoli and cauliflower in your top tray. Place it all together - lids on top. If you're using white rice, this will take approx. 15 mins on steaming temp (Varoma temp if using a Thermomix) speed 1 to cook your rice. Double check your rice, bacon and veggies are cooked. If not, cook for longer. If using brown rice, you'll need to cook for 30 mins - but again, check everything is cooked and remove veggies if they're done and continue cooking rice. Mix all ingredients together in a large bowl, serve with some soy sauce and enjoy.